We’re all busy. We all have multiple commitments and interests that constantly vie for our time. No matter how committed you are to becoming a better guitarist, the time available to practice is very limited. So, it can be beneficial to look for ways to improve yourself as a musician even when you are unable to actually practice on your instrument. 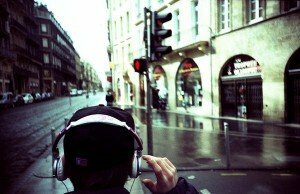 In this article, I’m going to give some ways you can improve through listening to music. Now when I say listening, I mean an engaged and concentrated form of listening. You won’t be able to do these things if the music is serving as a background to another activity like having a conversation, or if you are just passively listening. You can still possibly do another activity while listening in this way, as long as it is something that doesn’t take up much of your attention. First, you can use listening to increase your sense of rhythm. Put on a recording of anything you enjoy listening to. Try and lock in on where exactly the beat is. Try and feel the basic pulse of the music and move to it in some way or another–nod your head, tap your foot, etc. Then, switch to another song and do the same. You want to get to the point where you instantly and instinctively lock in on that pulse, regardless of the type of rhythm that is being played in the song. If that’s already easy for you, dig a little deeper. Listen to how the beats are being subdivided. Is each beat being sub divided into 4ths, or 3rds? Is there a swing or a shuffle in that subdivision, or is it straight? Again, you want to get to the point where you instantly lock in on these types of things. You can also use listening to help keep your place and learn the structure to songs you are working on. If you are new to playing the blues, an important thing is to know the blues progression well. So, throw on some blues recordings and focus in on the progression. Listen for the beginning and end of the progression and how it repeats. See if you can intuitively anticipate when the chord changes will happen. You want to really get the ‘sound’ of that progression in your mind. Jazz players can do the same thing. One of the most common problems for novice jazz musicians is getting lost in the chord progression that the tune is based around. Concentrated listening can be a great way to work on this. Put on a recording of the tune you’re working on. Anticipate when chord changes will happen. Keep up mentally with what chords are being played. Get a feel for the ‘story’ the progression is telling: how it rises and falls, how it twists through tension and release. Try fast forwarding to a random point in the middle of the song, and see how long it takes you to pick up on where you are in the progression. This can also be done for pop songs with a verse/chorus/bridge structure. You can listen to songs you are learning and try to keep up with where you are in the song, anticipating changes from one part to another before they happen. If you are a classical guitarist, or working on something that is intricate and doesn’t involve improvisation, you can benefit from concentrated listening as well. By listening to recordings of pieces you know or are working on, you can get ideas for how certain passages can be articulated. Listen for places where the performer changes the tone they are getting on the guitar, or how they handle the crescendo and decrescendo of phrases. If you are still learning a piece, see if you can follow along while listening to a recording of it and envision where the notes are played or how the various hand positions and movements are done. Visualize yourself playing while listening to it. Even though you aren’t actually practicing on the guitar, you’ll be further embedding that music into your mind which will help when you are really playing it. As you can see, listening can be a powerful tool for developing as a musician. You can use listening to improve certain mental processes that will be used when you are playing your instrument. Posted in Practice and tagged Beginners, Intermediate, Practice, Practicing Without a Guitar.